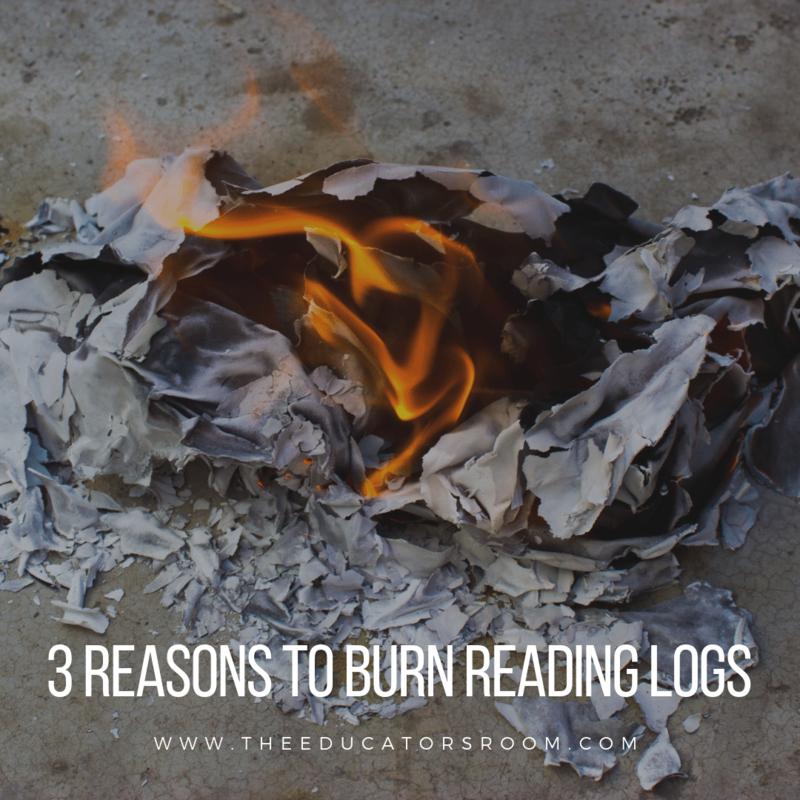 I’ve seen the distaste for #reading logs recently. Can someone define them for me? Is it the reading duration? The regularity? The deadlines? The assignments attached to them? I’m genuinely curious what counts as a reading log and what is troublesome. Although I have had a few roles in education, for eight years of my career, I was a middle school English teacher. I quickly learned some English teachers like reading logs and some don’t. As a former English teacher (now elementary library/media specialist) and as a parent, I do not care for reading logs. In fact, I say we should light them on fire. It kills the love of reading. In real life, you will read when you can fit it into your schedule. You will read when the book you have chosen for yourself is so compelling, you have to know what will happen next. Reading should never become a chore, an item on a checklist to complete. Completing a log is not the best way to get children to read. My middle school students read, on average, 35 books a year and it wasn’t because of a reading log. Reading logs are easy for students to fake. Yes, you could argue that we can’t really know if students are doing any of the work they are doing at home. For students to turn in other assignments, they did not do, they actually have to have a plan and involve someone else to give them answers or have someone else complete the assignment for them. For a reading log, you can do all of the faking by yourself. You can claim you read a book and you didn’t. If the teacher doesn’t have a follow-up assignment to check if his or her students read the books listed on their log, it can tempt even the most honest student to write down books they didn’t read. As an educator, if I’m going to create an assignment to check reading comprehension, then why do I even need the reading log in the first place? Reading logs don’t help parents get appropriately involved in reading. My twin sons’ school has a schoolwide reading/math log. Students are expected to read at least 20 minutes a night at least 20 days a month. Reading can include library books, magazines, textbooks, and online reading like MyON books. An adult must initial each night student reads. Students are expected to practice math facts at least five minutes a day at least 20 days a month. An adult must initial each night student practices. My husband and I decided when the log came home on the first day of the month that we would sign for reading and math for the entire month and place the log back in their folders. My sons are avid readers and read almost every day, but some parents don’t know if their children are reading. They just sign the log and send it back. What would be more helpful is if the school sent home tips to help parents ensure their children are reading or some questions they could ask their children instead of having them try to remember to sign a log each night when family time is already limited after school. I didn’t work at the same middle school during those eight years and I didn’t use reading logs until I worked in a school that mandated them. The English department had a list of assignments that all English teachers had to include in their grade books, but we had the autonomy to decide how to create the assignment. I gave my students a monthly log and told them it was the easiest assignment they would ever have because all they had to do was have a parent sign it and write down books they read. I made it the lowest amount of points of any assignment in my grade book, so a student could still earn an A in my class even if he or she never turned in a log. Kids will read if you make reading the culture of your class and your school. You have to talk about books, help students find books they are interested in, and give them time to read. Giving them a reading log will do none of that and my hope is that educators will abandon the practice of using reading logs.